Yet another post in english dedicated to my "worldwide-pals"! Today I'd like to introduce you a vegetable soup very popular in tuscany and so much apreciated by the tourists coming in my region. The "Ribollita" in the origin was created in tuscan's countrysides as a "poor" and simple vegetables soup in order to recycle the stale bread piled up during the week. Although every restaurant in Florence and in Tuscany prepares and serves it's own recipe that can taste differently case by case, there are a few important rules that every "Chef" follows. Another rule is to use the (unsalty!) stale bread piled up during the previous days and the last rule is that is preferable to eat this soup the day after, but having it re-boiled again (in-fact "Ribollita" in italian letterally means: re-boiled) and serve it hot and seasoned with a drip of raw tuscan extra virgin olive oil. Traditionally the base of this soup is a simple sautéing in extra virgin olive oil of carrot, celery, and onion, (in Florence these ingredients besides to parsley are called in the whole "odori", that in this case can be translated into: "flavours"). But, in modern times for an unwritten rule of many restaurants, many chefs add bacon and/or pork fat to flavour this soup. Obviously by this way cannot further be considered the traditional one but just one of some variations on "Ribollita" theme. About this traditional recipe I remember when I was on the point of teaching the "Ribollita" in a class at school to a british vegetarian family of indian origin, after reading the ingredients they asked me if we could make it without pork, as by travelling in Italy and having tried several restaurants they had come to the idea that it was a necessary ingredient in every soup! When I assured them that the "real" one was without and it was by far much better, they thought that actually I was making an exception and were grateful to me for doing this... but IMHO that's the way the "Ribollita" has to be made!! Put the white beans in a pot with cold water and let them soak for a whole night, then drain this water and pour some new one in the pot, up to cover the beans. Wash and rinse all the vegetables, cut the cabbage in thin stripes, remove the rib by the kale leaves and chop them (the leaves! ), chop also the chard. Mince finely onion and garlic , cut celery and carrots in small slices and put everything in a large pot with the extra virgin oil. After a few minutes add thyme, potatoes cutted in cubes and all the vegetables leaves chopped previously. Cook for a few minutes, then add the tomato paste (or the peeled ones), stir and cook still some other minutes. Strain a third of the beans and save them for later, then grind the remaining two thirds with their broth and add to the soup. Season with salt and cook the soup between 45 and 60 minutes, depending on the size of vegetables cutting. At the end of cooking add the entire beans left previously apart then cut the bread in thin slices, add it to the soup and stir to soak it entirely. Put off of the heat and let cool completely, stirring every once in while and adding salt if necessary. Rest in the refrigerator till the following day. Before serving it, put the soup in a pot, if too dry add some vegetable broth and bring to boil. Serve piping hot with a drizzle of extra virgin olive oil. I wish I meet you soon in Florence at the cookery school where I'm a teacher to enjoy cooking with you!! Vedrai che poi ci sarà anche chi la fa a modino, c'è ristorante e ristorante anche quì, io comunque sto a quanto mi han raccontato. La consistenza alla fine è quella di una pappa, è abbastanza consistente, tanto che a ribollirla devi anche far attenzione che non attacchi al fondo. dimmi che la metti anche in italiano.... vero???? Per la prima volta leggo il tuo blog. Mi piace!!! Davvero...complimenti per quei bellissimi dolci per cui anch'io ho uno spudorato debole! Un saluto. Ciao Valentina, non posso che replicarti i complimenti di tutto cuore, ho dato un'occhiata ai tuoi dolci e... sei davvero brava! Ciao Valentina. Ho passato un periodo di lavoro intenso e ho perso l'abitudine a fare foto e post. Il giorno dopo generalmente il ripieno ha un sapore più ricco, ma le paste da crosta perdono asciutezza e croccantezza. come mai in inglese ?????? cmq la ribollita l'adoro non ho ancora imparata a farla ma primo o poi devo imparare ..
Eh, ogni tanto metto qualche post in inglese, alla scuola abbiamo una clientela che parla inglese, lo faccio per loro! 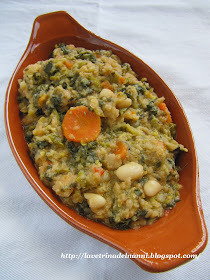 Non credo avrai nessuna difficoltà a fare la ribollita,ti ho visto fare molto di meglio nel blog! In fondo è una normale zuppa di magro, il fatto è purtroppo adesso non è la stagione adatta. E si non e la stagione ora ma finita l estate la voglio provare..
Secondo me andrai benissimo, se puoi però aspetta direttamente l'autunno quando cominciano a trovarsi gli ingredienti giusti. Sul cavolo nero ad esempio si dice che per risultare morbido deve aver preso la prima gelata... poi c'è chi lo passa in congelatore per avere lo stesso effetto! HO ABOLITO I COMMENTI, NON RIUSCENDO PIÙ A RISPONDERE IN TEMPO UTILE.